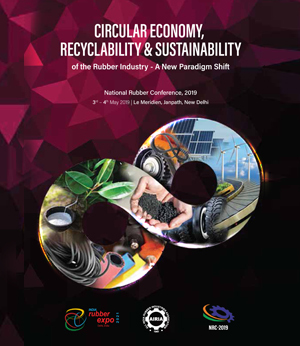 National Rubber Conference (NRC) is an initiative of All India Rubber Industries Association (AIRIA) to have the stake holders of the Indian Rubber Industry apprised of the global trends affecting them. It is an opportunity provided to the RUBBERPRENUER to be well informed to take strategic decisions today which will chart their future growth on a short as well as long term. All India Rubber Industry Association has been playing pivotal role in promoting the interest of its members and industrialist besides helping in boosting industrial activities in the country. Members of AIRIA mostly belong to MSME sector. The role of Micro Small and Medium Enterprises (MSME) in the economic and social development of the country is well known. It is the nursery for entrepreneurship, often driven by the individual creativity and innovation, with a significant contribution in the country’s DGP, manufacturing output, exports and employment generation. Currently we are passing through global uncertainties. It is critical to meet and discuss the current challenges faced by the industry and prepare an agenda for the future. At this crucial juncture, it is important that a cohesive voice of the industry is communicated to the government and policy makers. The National Rubber Conference signifies the emergence of the Indian Rubber Industry on the world stage with advanced technology and competitive rubber products reaching many countries across the globe. Envisioned with a difference, NRC is a national event held in all four regions of the country. Speakers from India and abroad deliver to the delegates complete exposure to the trends and development currently taking place at a global platform. The intention is to provide guidance to the delegates on their concerns such as raw material availability and pricing trends on a short as well as long term situation. Poor Power situation in various states and expected availability in high growth states with rapid industrialization and unpredictable pricing, raising concerns for diversification / expansion plans for the power and capital intensive rubber industry will be dealt with at this forum. NRC cover the topics which are the dos and don’ts for the sustainability of the rubber industry as it caters to customers with a global qualitative demand at a critical time while it stands at cross roads. All of which, be it technical development in polymers and chemicals or commercial topics such as future trends in foreign exchange valuation or automation in machinery, will be discussed at NRC. Participants gets an opportunity to interact with Rubber Goods Manufacturers on actual user basis, to be well informed about the future of the industry requirements and future developments. Speakers from various sectors of the large consumers of rubber products shall address the delegates to understand better the current and future market scenario. Suppliers of raw material and machinery make representations on the current developments and trends in rubber technology allowing the participants to understand better the subjects including Automation in machinery, REACH and environmental concerns for which they need to gear up. It is a must attend program for enthusiastic rubber technologists as well as entrepreneurs who seek a better understanding and guidance on technical as well as commercial issues. 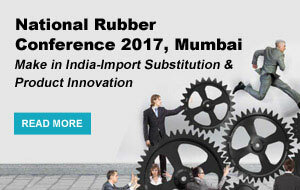 The event is one of the most comprehensive one and a half day seminar which informs the RUBBERPRENEUR not only on futuristic technical developments in the polymer industry but also requirement of rubber product industry now and in future as well as topics on strategizing decision of today for a successful tomorrow. 2012 – “New Challenges and Opportunities for Rubber Industry”. 2013 – “Technology and Innovation – The Driver of Future Growth”. 2014 – “Indian Rubber Industry – In Threshold of Global Competition”. 2015 – “Path to Future – Stride with NRC”. 2016 - "Technological Innovations, Green Energy & Brand Creation Key To Success"
2017 - "Make In India Import Substitution & Product Innovation"
2018 - "Technology Adoption and Market Expansion"
2019 - "Circular Economy, Recyclability & Sustainability of the Rubber Industry – A New Paradigm Shift"
NRC offers the much needed international, technical as well as commercial exposure that the Rubber Industry looks forward to.